Things to do in Blowing Rock NC are never-ending. Outdoor enthusiasts, adventurists, serious shoppers, history buffs, art supporters, children, and even homebodies will revel in all that this town has to afford. When you extend the opportunities to the rest of the High Country, you’ll have your work cut out for you deciding what to do when. Buying a house here is a great investment for this very reason – the lively environment appeals to people of all interests and situations. Let The Mountain Group at Premier Sotheby’s International Realty take you on a tour of local listings, and introduce you to the area, as well. This way, you’ll be able to dive right in to experiencing your new home upon moving in. Kayaking on the New River, golfing at the many public and private golf courses, hiking Grandfather Mountain, touring the galleries downtown, ice skating at Appalachian Ski Mountain, or spending an afternoon at Tweetsie Railroad – these are just a glimpse into the delightful options. Sightseeing alone is an activity that you’ll be enticed to do, and how could you not when you’re in the midst of one of the most beautiful places in the state, even country? The Blue Ridge Parkway is the most scenic drive, and it could be in your back yard if you invest in a Blowing Rock property. No matter where you live within the High Country, none of these points of interest will be out of reach. Especially after one visit, you’ll see their worth for yourself and be able to justify a little longer of a trip. Don’t think that this summarizes the selection of fun to be had. Antique shops, state parks, gem mines, not to mention seasonal festivals and events further foster a well-rounded region. 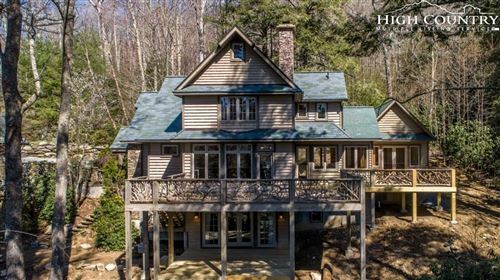 The real estate we feature is impressive, so it’s only appropriate that the things to do in Blowing Rock NC are equally impressive.